Aquaworld Aquarium - Article - Pondering a Pond? If you are thinking about installing a pond, it is a good idea to do a little research before you start. There are many books and internet resources with different techniques to design, installation, materials, and filtration. It is a good idea to read as many resources as you can before you start the project. The construction costs for even a small pond (less than 1000 gallons (263 l) can be in the thousands of dollars, not just in the materials to construct the pond, but also in the landscaping materials that will go around or in the pond (rock work, plants, etc). Pond construction is not something you normally do on a weekend. It often can take months if you do it yourself. Spending your time and money on this big project can be disappointing if you do not choose the right material and filtration system. First you must decide on what kind of fish, invertebrates, and or turtles you want to keep. Koi get very large 30 inches (75 cm) plus and require about 100 gallons (380 l) per adult fish. They grow quickly when young, usually about 6 inches (15 cm) a year their first two years. Goldfish are smaller than Koi, but they can exceed 12 inches (30 cm) and require about 15 gallons (57 l) per fish. Although Koi and Goldfish are the most common fish kept in ponds, other fish like White Cloud Mountain Minnows (Tanichthys albonubes), and Paradise Gouramis (Macropodus opercularis) have also been keep outside all year round in temperate climates. Many hobbyist keep tropical fish in the pond in the summertime. I personally like to keep livebearers like Swordtails (Xiphophorus helleri), Platies (Xiphophorus maculatus), Guppies (Poecilia reticulatus), Endler's Livebearer (Poecilia wingei), and Variatus (Xiphophorus variatus) in the pond during the summer. These livebearers do an excellent job at keeping mosquitoes under control and they will also grow and multiply quickly in the pond over the summer months. As long as the pond water is at least 60° Fahrenheit (15° C) they will do fine outdoors. If the water gets cooler than that it is time to catch them and bring them inside. Many hobbyist also add Plecostomas to the pond in the summer to control algae growing on the walls and rock surfaces of the pond. These fish will also need to brought inside when the water gets to cold. Crawfish are also kept in ponds to help control algae. One draw back with Crawfish is that if they can, they will often crawl out of the pond. Turtles are a great accent to the pond. They can become very tame and will often eat out of the owners hand. 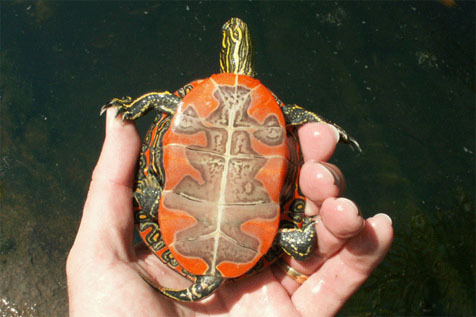 The common Red-ear Slider, and Painted Turtles are great in ponds. They can be kept outside all year round and will hibernate during colder months in the bottom of the pond. Contrary to what most people think about turtles praying on the fish, in ponds turtles have a hard time catching fish, so they tend to leave them alone in a pond. The turtles are primarily scavengers, preferring to eat bugs, snails, fish/turtle pellets or sticks, and fresh fish filet pieces from the owners hand. Red-ear sliders tend to like to nip at aquatic plants, but I find the Painted Turtles to be more plant safe. If you plan to keep turtles you need to have a place where they can crawl out of the water and bask in the sun. These turtles are referred to as "semi-aquatic", meaning they like to travel across land every now and then to look for a new pond. You should make sure they have no way to escape the yard. One of the most colorful turtles, the Western Painted Turtle (Chrysemys picta belli) is native to Eastern Washington State, British Columbia, and as far East as Wisconsin. Where you locate your pond can have a great affect on how much you enjoy your new water feature. It is best to build a pond close to where most activity in the garden will be, like near a patio. You will also need to think about how you will get electricity (for your pumps, filter, ultraviolet sterilizer, night lights), and water (to fill the pond, float valve) to the pond. Also consider if there are any trees, or bushes near by that may produce excessive leaf litter. For all ponds that have aquatic life in them, I recommend that the pond "water depth" be at least 2 feet (60 cm) deep. The depth is very important, as predators like raccoons can wade in shallow ponds and catch fish. If the pond is deep, the Raccoon has to swim and the fish can escape to the deep. If Herons can wade in the pond they will make a meal of your fish. It is best to design the walls of the pond so they go straight down to prevent predators from wading in the pond. How you shape the outline of your pond is not that important, but shaping the bottom so that the bottom slopes away from the return/waterfall is best. Having a deep end pocket area where sediment can be collected and pumped out for cleaning is very helpful. 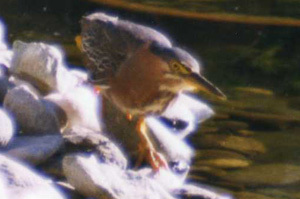 Green heron looking for an easy meal. 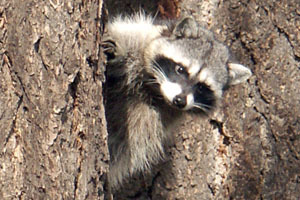 Racoons can clean out a pond overnight if it is not deep enough. If you are an aquarium hobbyist you may understand how to filter a pond, but probably not. 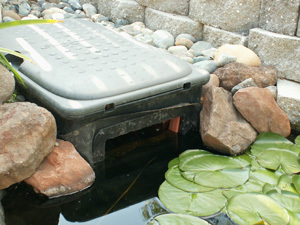 Outdoor pond filtration is much more difficult. 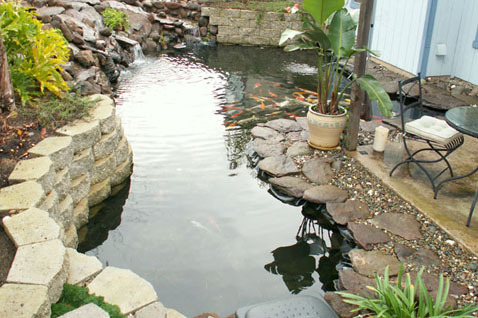 You have many more environmental variables affecting the pond than you do with an aquarium. The pond often receives direct sunlight which combined with the nutrients from the decaying animal waste and plant matter create massive amounts of algae to grow. The two types of algae that plague ponds the most are string (hair) algae, and green water (single cell algae). String algae grows on surface area in the pond. Some fish will eat string algae, and help control how long it gets. Green water algae is the biggest problem for most pond keepers. Green water algae can be completely eliminated by making sure you include an Ultraviolet (UV) Sterilizer in your filtration design. Green water is common in ponds that don't have a UV sterilizer. The green water is so bad in this pond you only can see the fish when they come up to feed. Most people that do not include a UV, get frustrated trying to keep the water clear with chemicals. I do not recommended the use of chemicals to control algae, as they can harm other beneficial organisms in the pond, and if you overdose you can kill your fish. A more natural way to control algae is the use of barley straw, extract, or pellets. Algae is a natural occurring inhabitant of all ponds and plays a important role in keeping the pond environment healthy. Total elimination of all algae in a pond upsets the ecological balance of the pond, and removes a lot of natural fish food sources that feed and live on the algae. Particulate filtration or mechanical filtration removes the organic matter (fish waste, leaf litter, free floating algae, aquatic plant matter, dust particles, etc). There is a ton more of organic matter that needs to be filtered out of the pond as compared to what is found in an aquarium. The filter needs to be able to handle large amounts of particulates. Sponge filters get clogged quickly in outdoor ponds and are not recommended. The best filter designs use a staged approach to removing particles from the water. A course media to start, and than it passes through finer and finer filtration media. Pressurized filters are easy to clean, great at particulate filtration, but normally require high head pressure pumps to operate which are usually not very energy efficient. A surface skimmer is of added value to the filtration system, as it remove a lot of leaf litter and bugs that fall on the surface of the water before it has a chance to settle to the bottom of the pond. 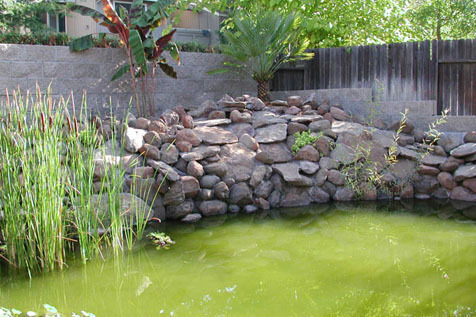 Biological filtration is not that important for an outdoor pond unless it is heavily stocked. 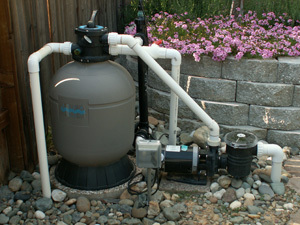 Most biological filtration happens within the pond, so biological media in a pond filter in most cases is unnecessary. Making sure your pond water is saturated with oxygen is very important, especially if your pond is heavily stocked. During the winter months the fish use less oxygen, and cold water also carries more oxygen then warm water. When the water warms up, the oxygen carrying capacity of the water is reduced. If your filtration system is not running when the water warms up, you could lose fish. Wind also plays a role in keeping pond water oxygenated. Wind blowing across the surface can create a current in the water and help bring water to the surface where gas exchange happens. Pond skimmer/filter box (left), and a pressurized filtration system and UV sterilizer (right). Live plants can help in reducing nitrate accumulation in a pond, but they also can create excessive amounts of plant matter your filter will have to filter out. Having plants in the pond usually requires you to clean your filter/s more often. Some plants are easily broken by fish and end up in the filtration system. All plants and animals should be quarantined before introducing them into an established pond. Ponds the consist of thousands of gallons of water can be very expensive to treat with medications. It is much cheaper to set up a fish tank to quarantine the fish and plants for at least 3 weeks, and observe for any health conditions that may need treatment. Aquatic plants can be vessels for transporting parasitic diseases from one body of water to the next. I have seen a severe case of fish lice in a pond that was transported with the introduction of new aquatic plants. Research is the key to building an enjoyable pond. There are many koi clubs, pond equipment manufacturers, and vendors with web sites on internet. Ask questions, and seek out advice from experienced pond keepers before you go ahead with the project.